Something I’ve realised – to my regret – is that I barely register lyrics any more. The older I get the more my attitude to them becomes like some distant, inattentive relative, receiving family news, eyes barely open, with a “that’s nice, dear” or an “mm-hmm”. Often, the pull of the music and its mood actively works against any attempts to pull my thoughts together into concentration on the ‘text’. Take “Footsteps”, lead track on Kehlani’s short new record, a duet with Musiq Soulchild whose atmosphere of vaporous regret overwhelms its detail. “I left footprints in the mud so you could follow me”, Kehlani says sadly, a nice image for the indistinctness of the track and her style, specifics erased by the singer’s sighing melisma. That’s not to say the dynamics of the record aren’t apparent – even loved up (“Feels”) this is a sadder and a wiser Kehlani than on 2017’s SweetSexySavage, dealing with disappointments and the anticipation of more. Male guest-stars show up to bluff and brag their way through explanations, while Kehlani flits and swoops around them – her own raps, as on the TLC-esque “Morning Glory”, are more sprightly and pointed. A luxurious, lonely record – good for grey Sunday mornings. No such lingering trauma for post-Robyn pop singer Betty Who: “naked in the living room / and just like that I’m over you”. Fresh-won independence is both text and subtext here – this is her first indie release after initial major label success. She’s trying on different styles, different eras too – a Cheiron-style late-90s bumper on “The One”, an uncanny sound-of-’86 tableau on “Just Thought You Should Know”. The link is often the breathy, half-spoken style she likes to use, and not everything works by any means – repetitive vamp “All This Woman” is a chore, for instance. Cherry Glazerr, the vehicle for rock songwriter Clem Creevey, find a sound and stick to it on their third album – a slick, loud 90s alt-rock vibe, simultaneously sludgy and glossy. It’s comfortable and attractive enough to carry the record even when the songs don’t. Mostly they do, though – Creevey likes sudden shifts of gear and blurts of anger, switching between a diffident coo and a wrathful shriek on tracks like single “Daddi”, whose taunting pantomime-submission puts sights on patriarchal targets otherwise left vague. Jazzer Hank Mobley offers a more benevolent paternalism. 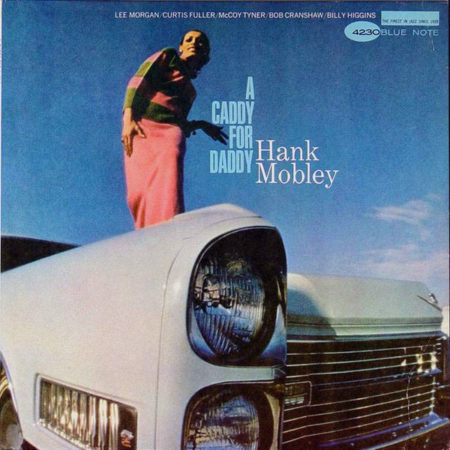 The jaunty swing of “A Caddy For Daddy” carries the breezy confidence of a TV or movie theme from the American mid-century, the kind of self-possession that would shape my early perception of the US when I caught such things on BBC2 as a kid. The rest of the LP is more reflective but just as delightful, Mobley’s sax playing smooth enough that when he starts to blow harder it’s all the more authoritative. Also from 1965, and even more scrumptious, is Dorothy Ashby’s The Fantastic Jazz Harp Of Dorothy Ashby. This is harp as in actual whopping great harp, not as in harmonica, and it sounds so richly pretty I feel quite decadent for listening to it. Ashby had a glittering, polymathic career in jazz, theatre, pop session playing, and more, before her too-early death. This album isn’t quite as space-age-bachelor-pad groovy as 1968’s more orchestral Afro-Harping, but it’s beguiling in a different way, Ashby’s harp solos giving a spun-glass delicacy to her group’s small-club sound. One of my more unusual recent work requests was an email asking me if I’d ever heard of “hauntology”. Hooo boy. This enquiry, as innocent as a naïve antiquarian in an MR James story, disturbed all kinds of floating spectres and I wrote an unasked-for 1000-word explainer tracing the idea from Derrida to “songs about ghosts”. I’m mentioning this because Teeth Of The Sea’s new album is called Wraith and has – perhaps? who knows? – a faintly spooktacular theme, its sparse electro rattles and undulating bass overlaid with snippets of undead tape voices and the lonesome moan of a single trumpet. A sort of spiritual descendent to Sabres Of Paradise’ Haunted Dancehall, this, except that album’s phantasmal memories evoked the traces of the Black British culture of West London, and Wraith feels more like a Haunted Construction Site or a Haunted Regeneration Project, its unquiet gusts of brass set against the grind and clank of the ever-modernising city. Potent, in any case. And finally one of my most anticipated LPs so far this year, an odds-and-sods collection of offcuts and remixes from Swedish/Finnish* post-rockers Horseface, whose Jaakausi, from 2017, brought Too Pure and The Raincoats to mind with its devout faith in the creative power of repetition. Jaakautiset, its cassette-and-digital companion piece, is more of the same. The back end of this is a fairly pointless remix album – Horseface’s songs are already built around played-live loops and builds, and tweaking those removes some of the band’s feeling of spontaneity. But the first five tracks – songs left off the previous album – are more of the same enchanting racket I fell for two years ago. More racketish than before, even – “Aanekas Maailmanmestari” is a staircase-tumble of broken rhythms and detuned keyboards, the kind of ear-tricking primitivism Pram used to go in for. “Daga Daga/Dagateng” reaches even further back, to the frazzled, mantric, synth-psychedelia of Dalek I Love You or the very early Teardrop Explodes (this particular track pushes tolerance for repetition beyond even my limits but the sounds it makes along the way are terrific). The best track, “Porina”, goes further and deeper than anything on Jaakausi, a beautifully building mesh of drones, pulses, spoken word, and snatches of plucked melody. There were points two years ago where I convinced myself I’d overcommitted to Horseface, turning a good group into something greater than they were because I wanted to ‘find’ something special in the forests of streamed sound. These five tracks – their best and strangest music yet – reassure me I was right the first time. *I think the deal is that the singer is from Sweden’s Finnish minority, who are expected to speak and read Swedish in school, so she’s is a Swedish speaker, but sings in Finnish to make a point (a bit like Gwenno and Cornish). Hope this isn’t seen as ungrateful, but is the Popular project still going? Seems like 3-4 months between new entries is the norm these days. Just cheering from the sidelines, I think it’s such a great undertaking and I want it to succeed (whatever that means). Cut to Tom, on his deathbed many years hence, at work over a review of the most recent #1 on the chart of sensory zapzips beamed straight to our Fifth Organs. He actually caught up some years ago, but it never brought him the peaceful nights that everyone assured him it would. Popular will be back. Motivation is (obviously) low at the moment, but I certainly haven’t abandoned it! It has run into a problem, though, which is that I can remember conversations about 00s’ pop songs the first time around, which makes it feel like I’m retreading old ground even though I’m not (in Popular terms). I should probably have anticipated this! Thanks Tom, I have enjoyed it so much over the years (14 and counting for me …). I’ve never been good at lyrics. Well, there are definitely lyrics I love and songwriters I admire. But I got into music via instrumentals – 80s synth TV and movie themes (the future it hinted at) and that is how I heard 80s pop – beat and texture first. Then it was prog via 20 year anniversaries and then 90s electronica. I didn’t connect with lyrics again until mid-Uni.